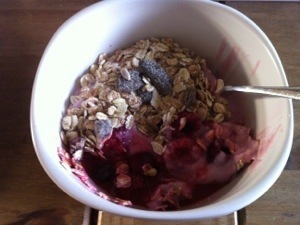 Food this past week has mainly been Dorset cereals muesli with chopped banana, a blog of Tesco rhubarb and vanilla fat free yogurt (the 450g tub – and it is free) and a chopped strawberry on top. then mainly water, nas squash, tea and fruit tea all morning, left overs or one of my homemade veg based soups for lunch, a syned treat in the afternoon (there was one day when I had a crunchie from the vending machine for 9.5 syns) and lots more sugar free fluids to get me through the afternoon and to dinner time where I’ve been having a much smaller portion of a sw recipe using my plate so I have have half super free and half free foods and then waiting until I actually felt hungry again before having any dessert (either fruit, yogurt, sugar free jelly etc) which most of the time I’ve found im not hungry so havent bothered. we have been having the kitchen refitted this week so have had to eat out once in the evening as hadn’t prepared something to microwave that night, we went to harvester and I had flame grilled chicken breast, and salad from the cart with a drizzle of thousand island dressing and diet pepsi, we even skipped dessert and went to the Tesco next door and got a sugar free jelly pot and a muller light fat free yogurt to have at home instead. this week coming up looks fairly good, I have two meals out but both are at other people’s houses and both will be a roast dinner type meal that I will be able to help myself to, so can control portions without coming across as rude for leaving food (I’d never do that actually, I’d just eat it all and feel ill!) just will need to watch the wine and pudding intake. as I am off work for 5 days now over Easter and I plan on cooking some new recipes in my new kitchen (although that will involve getting it dirty I suppose ) I’ll post them on here with pics if they turn out ok.
hope you all have a good week and that we get though Easter without succumbing to to many of those pesky chocolate eggs!! 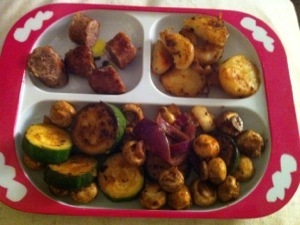 So the children’s animal plate doesn’t look quite so silly now with a whopping 4lb weight loss this week! I’m so shocked it was that much, but obviously very happy, just hope i can keep up with doing the same things that worked so well for me this week. i had a meal out on Saturday night at a Thai restaurant, i stuck to diet coke to drink, which was fine as i was driving anyway. When the prawn cracker bowl came out to start, i nervously ate a few thinking they must be full of syns, but after looking up the syn value afterwards they are a surprisingly low 5 crackers for 1.5 syns, so i could have had a few more! i will know for next time though. For main i had a chicken pad Thai which was exactly what i fancied and i think the only syns would have been in the oil used to stirfry it – i had a great night! 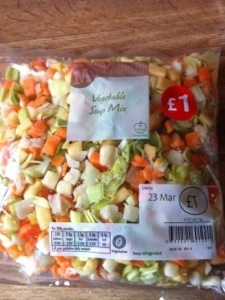 I’ve been wanting to make soup for a while but can never be bothered to chop and prepare all the veg to make it, so when i saw a pre-prepared soup mix in Morrisons for £1 it was perfect for me. 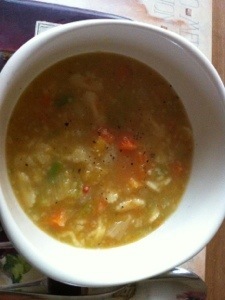 it was chopped carrot, butternut squash and onion with some fresh coriander chopped into it. i just boiled the contents with a veg stock pot and some mini pasta shapes then blended half of it and mixed back together. it was delicious and made enough for 2 lunches and was really filling too. 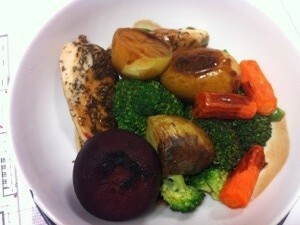 will be making this again, there were other flavours too which i am going to try. i went to running club on Wednesday and met my friend for a run sunday morning and did 3 miles each time, this is something i would really love to keep up with as i enjoy it so much and as am in the office all day it’s great to get out and get some fresh air. So i will be aiming to keep up all of these good things this coming week, i do have a weekend away the girls this weekend though which is going to involve lots of cocktails, a meal out and breakfast in the morning. i’m gong to try to stick to gin and slimline tonic though and have what i fancy for dinner but not stuff myself and stop eating when i am full, i’ll try to order a smaller portion if possible and im going offer to cook the morning after breakfast so i can cut my fat off my bacon etc. If all else fails I’ll just have to stay on the dance floor all night! I’m not expecting a huge loss next week like i had this week. but 2lb would be wonderful. 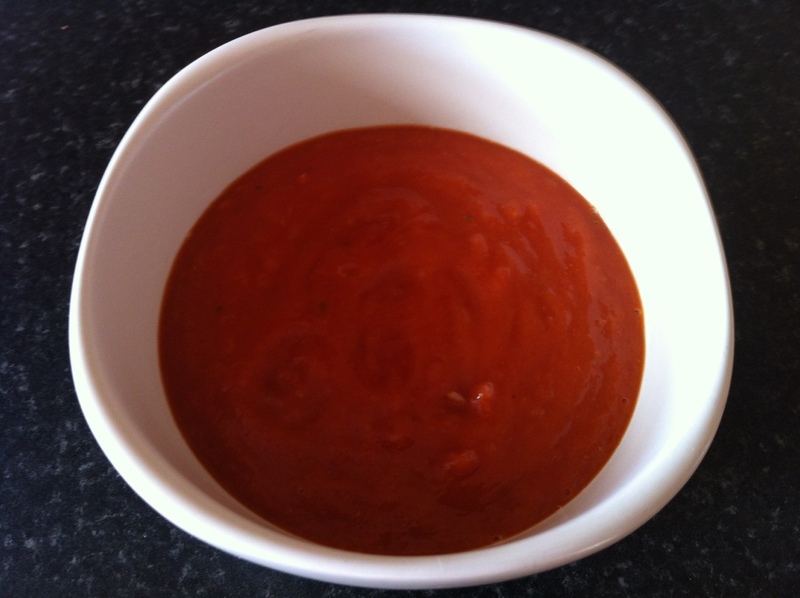 week 11 – just because it’s “free” doesn’t mean it has no calories! As promised, after not blogging all week here is a quick catch up from the past week and my weight difference at weigh in tonight. Well basically the week was a complete right-off, from getting fed up with it all and thinking I could have a “blow out day” which turned into a blow out week 😦 on top of that for the last 3 nights I’ve stuffed myself so full of food (some of it even free food!) that I’ve not even been able to sleep I’ve been so uncomfortable. the only good thing I did this week was make it to running club on Wednesday which I really enjoyed and am going to try to get back into the habit of going each week. So thinking about how I can turn things around this coming week, I’ve written a meal planner which includes lots of veggie based dishes to boost the superfree percentage and I’m going to try and snack a bit less as even though I generally snack on free or superfree foods (well, not this week!) I’m snacking because I’m bored or I think its ok because it’s syn free and I’ve planned to have it, when I should only really be snacking when im hungry. To help with this I’m going to try to drink more water / sugar-free squash / fruit tea as I’m really only looking for something occupy myself with. 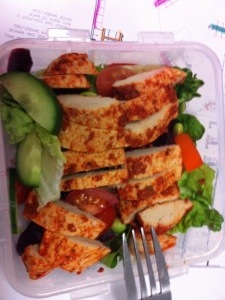 The other thing im going to try this week is having smaller portions. 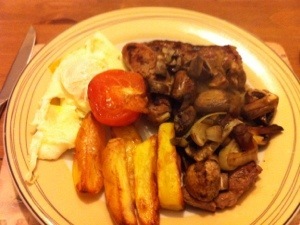 I know with SW you can have as much free foods as you like but it really should be 1/3 superfree and what I tend to do is pile my plate with, for example, sw chips, then lean meat then add a token bit of veg on the side, I then eat all the chips and meat until i’m full but continue to eat anyway to “get my 1/3 superfree” which is ridiculous… talking of ridiculous, I brought these plates a few years ago as I liked that they were split into sections (yes they do have cartoon animals on and yes they are for children!) 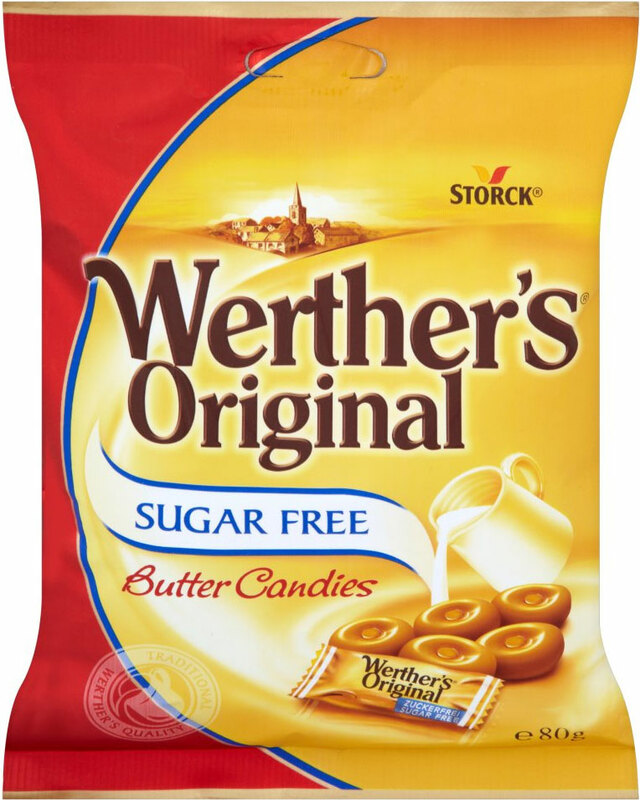 but they are perfect split-wise for have free foods in the smaller two and superfree in the larger section. 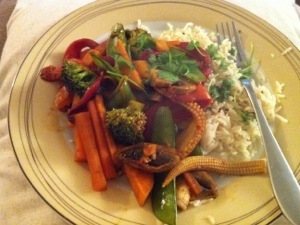 Heres my dinner tonight, and yes I have cut up my sausage! it doesnt look like much food (compared to my usual portions) but it did fill me up surprisingly and I can always fill it up again if im still hungry or use it to have for example 1/4 sugar free jelly, 1/4 fat free yogurt and 1/2 fruit. So I’m feeling positive about the week ahead, im unlikely to get the 3lb off in one week but I would like to get 1lb off at least for next weeks weigh in. Hope you all have a good week, will fill you in on how I’ve got on next week. Apologies for not posting for the last couple of days, I’ve been so busy I’ve not had the time this weekend… which brings me onto saying I’m not going to be posting every day from now on as it’s getting a bit to time-consuming. It has really focused me over the last ten weeks though. So with the first half stone gone and the last half stone to go i will now be posting once a week, on weigh in night (Thursdays) with a bit of an update of how the week has been, any major achievements or obstacles I’ve overcome and any new recipes I’ve tried plus my weigh loss for the week (notice how i say loss – positive thinking!) and hopefully with only blogging once a week i can put a bit more time into the post and make sure it has all the relevant information and photos in it to make sure it’s an interesting read. Don’t fear though I’m still sticking to plan as much as possible and will be attending group every week. I am aiming to lose this last half stone by April, just in time for summer! *You can see my weekly weight loss and running total under the “about” section. 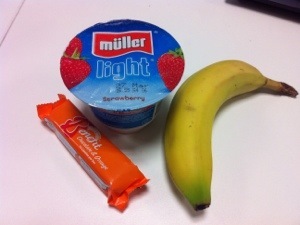 it was an early start this morning so i took some breakfast items into the office with me. 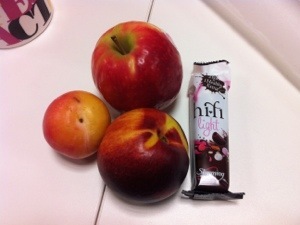 snacks throughout the day we mainly fruit and the other half of my hexb on hi fi bar. 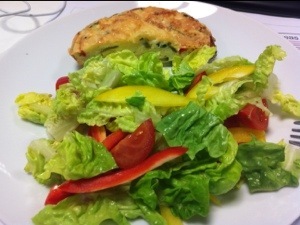 for lunch i made a egg and cheese fritta with courgette and peppers and a side salad. i must admit there was a rather large looking nice cake at work for a colleagues birthday and i did have a small slice with a cuppa, not sure of the syn content as it was home made but that’s all im having syn wise today so hopefully its not to many. im quite please i managed to enjoy tonight with out going overboard on the syns. we have people over for a curry tonight so hubby is cooking me a SW friendly curry and i plan to stick to diet soft drinks throughout the evening … will let you know how that goes tomorrow. those doughnuts are still flippin there! today was a hungry day that’s for sure so it was quite hard to keep saying no all the naughty treats that were on offer today. I don’t think that it helped that i had my breakfast so early, i wanted to eat then walk the dog then go and do the food shopping and get to work all before 8.30am which resulted in me not only walking the dog in the dark but eating my breakfast so early that i was hungry again by the time i got to work. So after the bowl of banana, strawberries, yogurt and muesli i also had a banana and a take out coffee upon arrival to work. I as also annoyed to see that the doughnut i reluctantly said no to yesterday was still there waiting to be eaten, but i did a quick syn check online (well i was tempted) and i didn’t think 15.5 syns for a stale doughnut was worth it so had a satsuma instead. 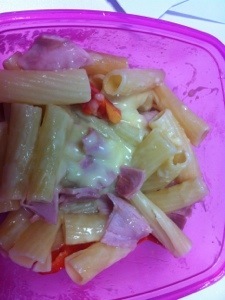 I was supposed to be doing a SE day today but lunch didn’t really meet this criteria as it was pasta, ham, a hexa portion of cheese and a few bits of customary red pepper, which wasnt even 1/3 superfree let alone 2/3 – but on the plus side it was very filling. it was however a long afternoon and i snacked on some grapes and a bag of rivita minis (hexb) along with a couple of mugs of tea. 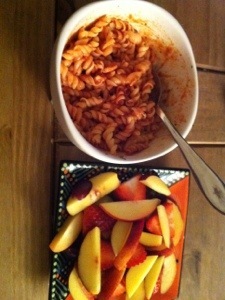 As i was out tonight i had an early (and quick) dinner of a very unconventional tomato mugshot and a fruit salad. Now here is where things started to go a bit wrong. I knew there was going to be a buffet where i was going so i thought if i ate before i went and took a banana with me i could resist the temptation… however, i ended up having two quarter sandwiches one with cheese and tomato and one with pork and i had a slice of chocolate cake, 5 jelly babies and 4 crisps. well at least i kept count so i didn’t go to made i suppose, but still all high syn stuff. 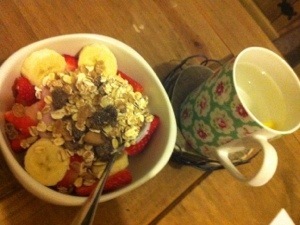 I had a mid morning snack of a banana and mug of tea. As it was a lovely sunny day today i walked to the shops at lunchtime then ate my packed lunch of quorn and salad I’d brought with me. I had to side step a jam doughnut this afternoon (quite proud of myself actually!) 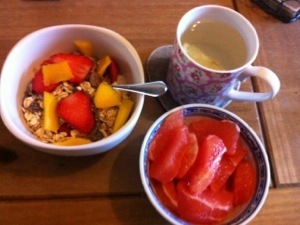 and had a feast of satsuma, grapes, apple and a bag of mini rivitas instead along with another mug of tea. The title of “pyjama victory” is because i tried on some pyjams hubby brought me for xmas (in the size i told him i was) and they now fit! yay! Its been a so-so day (SW wise that is – I’ve had a lovely day off work in the other sense) as the dog was staying over i ate my breakfast whilst being stared at by her with the look of “put the food down and walk me” on her face. But i tried to relax and eat my breakfast of raspberries, ww cherry yogurt and muesli and a mug of tea before taking her for a short walk. 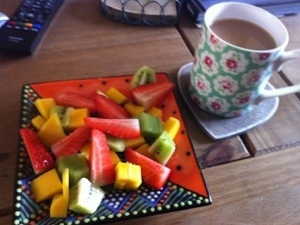 that didn’t fill me up for long though and mid morning called for a fruit platter with another mug of tea, then it was on with the gardening. 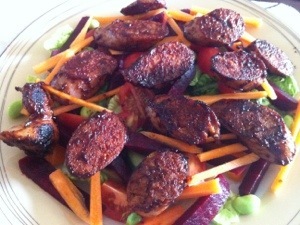 a short stop for lunch and i had 2 low syn sausages from the butchers left, so i grilled them (NO fat came out at all!) whilst i made a salad of little gem lettuce, beetroot, soya beans, peppers, tomatoes and carrot then i sliced the cooked sausages and popped them in a frying pan with some soy sauce, chilli and tomato puree and heated until they went sticky. The food i didn’t take photos of were a banana, a bite of honey sandwich on white bread and a bite of Aero chocolate (both of these were my husbands and I have ZERO willpower!!!). I am going to guess at 2 syns each? I made peri peri chicken from jamie olivers 30 minute meals book tonight, except i used quorn fillets instead of chicken, not because i’m vegetarian but i like to eat free range chicken and it’s quite dear so i don’t buy it all the time and use quorn instead which i also like. 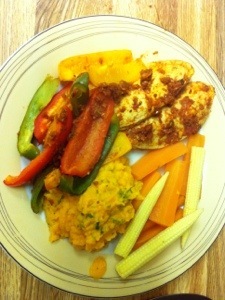 i served it with baked peppers, carrots, sweet potato mash and mini sweetcorn. 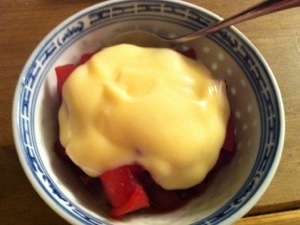 I also stewed some apples and frozen mixed berries with some cinnamon and sweetened with sweetener then spooned on a couple of dollops of low fat custard. lots of gardening – in fact everything aches already!